As the damage from Hurricane Sandy is disappearing and some things are returning back to normal for those in the hardest hit areas, six months after that hurricane devastated parts of the East Coast, Verizon is telling some customers that they will not be getting their landline phone service back—ever. At least not from them. It happened to the residents of Mantoloking, New Jersey, who were not given the choice to return to telephone service through a landline, but instead were offered Verizon’s Voice Link service, a landline-like service that works through the company’s wireless network. At least for now, it looks like the Voice Link service won’t cost any more than a landline, and it has many of the same features—like caller ID, voicemail, and 911 service—as what it's replacing. However, the lack of landline service also means that DSL won’t be returning to Mantoloking residents either. 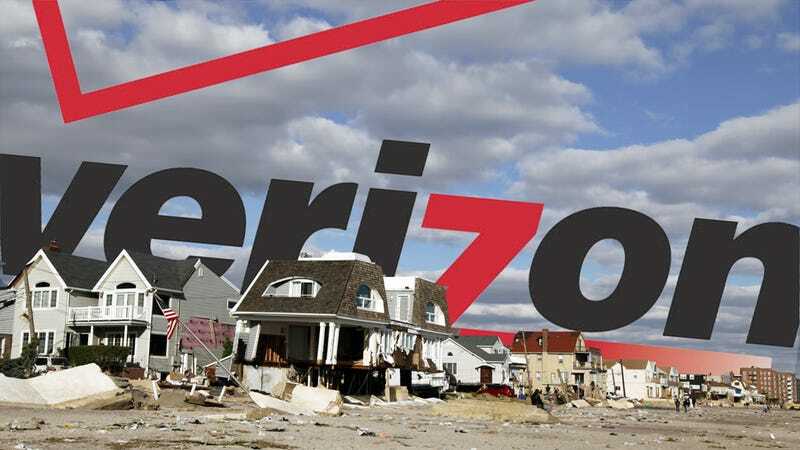 Speaking to StoptheCap, New Jersey local Dale Smith said he talked to a Verizon manager about the problem and he said the company was "evaluating certain service areas" for an "exciting new wireless product" instead of making repairs to the damaged land network. And reportedly, an FCC representative has responded to a local's complaint saying, "If Verizon wishes to replace the copper wiring with fiber it is strictly their business decision (sic)"
Long story short, Verizon seems to be more interested in upgrading customers to their wireless and FiOS networks than replacing the old copper-wiring utilities. It's unclear if Verizon can't or won't fix the old system. While upgrading to a newer internet or phone service is usually something people prefer and may even be excited about (see Austin, TX), being forced by your utility company to migrate to a new service after a going through such an ordeal on top of waiting six months for your basic phone service to be restored is obviously less than desirable. You can read more about Mantoloking and other Hurricane Sandy communities forced by Verizon into a trail of data-tiers at StoptheCap.com.